Flavor: smooth, creamy, silky, full in mouth, very sweet and unique! This AiLao Shan shou Puerh is high-mountain tea. It is sourced from raw materials gathered in Zhenyuan Yi, Han, Lahu Autonomous County in the Simao tea harvesting area of Yunnan. The tea forest is tended by the Yi, Hani and Lahu people who protect the village tea tree groves that are located here. Zhenyuan County spills across two mountain ranges – Wuliang Shan and AiLao Shan – that run parallel to one another, stretching from north to south in Pu-erh (Simao) Prefecture. These heavily forested, bio-diverse mountain areas are home to many wild tea trees and old cultivated tea groves that yield an astonishing array of unique teas each featuring distinctive tastes. Each tea that we taste from these tea producing regions of Yunnan is so different one to another – in a world that increasingly has a dark and gathering sameness we are grateful for that diversity and personality in the cup. Last year we added a Yunnan AiLao Shan black tea to our stellar lineup of Yunnan hong cha. We so loved that tea that we inquired about other teas from that area and voila, this delicious AiLao Shan shou pu-erh came our way. This beeng cha is made from spring large-leaf varietal arbor leaf materials and was pressed by the Fu Cha Tea Company, a Taiwanese tea company now operating in Yunnan and responsible for sourcing and pressing fine Pu-erh in remote high mountain areas. 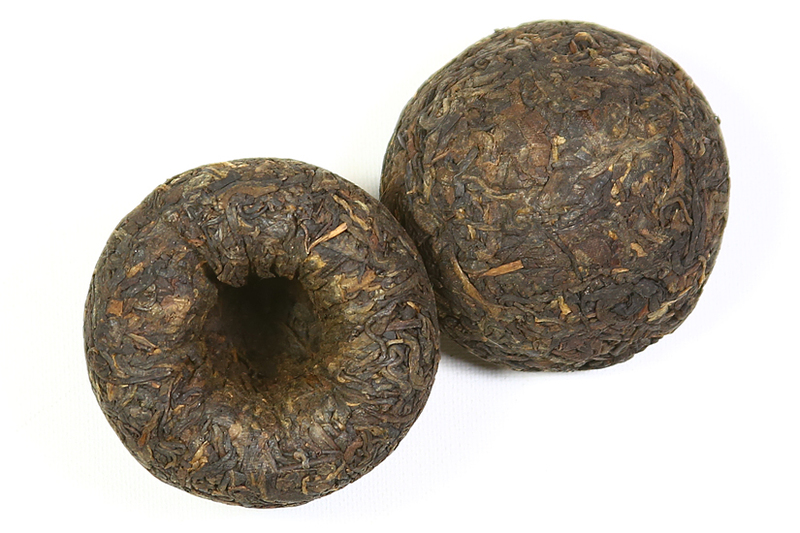 The tea is lovely and smooth and sweet – a terrific example of how delicious shou Pu-erh can be. The leaf materials have been given medium fermentation and the tea has been stored for 10-years storage in clean conditions. The resulting tea is rich and round in the cup with lots of caramel and deep red fruits. This tea exhibits the underlying flavor characteristics that we found so compelling in the black tea from this area. This Pu-erh is for serious tea enthusiasts who appreciate well-made tea that has aged beautifully and that will continue to age like a fine bottle of red wine for years to come. The tuos were given a tighter compression (pressing) to create better keeping conditions for the tea. 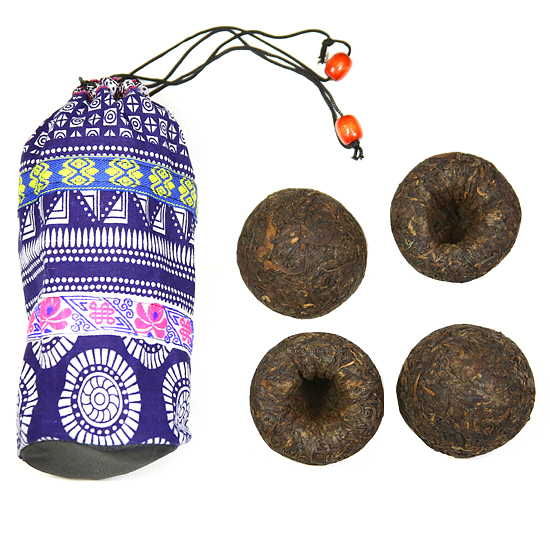 These small tuos are a great way to experience Pu-erh from this region. Good terroir coupled with good farming techniques and good tea factory techniques yields delicious and distinctive tea. This is just the kind of tea that we like and we will be hunting for more good tea from the AiLao Shan in the seasons to come.